Adult Fare: $60 USD per person. Child Fare 2-6 years old: $35 USD per person. * This Park is closed on Mondays. Includes: transportation, entrance fees, guide, snacks. Take a leisurely hike with a highly trained, well-educated Costa Rican naturalist guide through our exotic, bio-diverse tropical rain forest preserved in our 34 year old Manuel Antonio National Park. See how many different kinds of flora and fauna you can spot just in the span of a 3 hour nature walk or hike. Snacks are offered during the tour, and guest may remain in the park after wards. 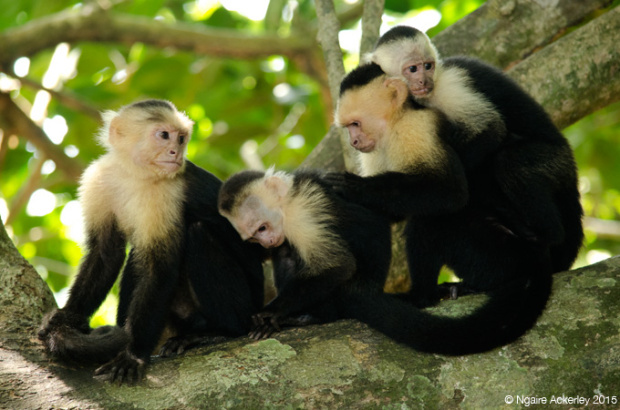 Discover Costa Rica’s number one visitor spot with the Manuel Antonio specialist since 1989. It will be just like experiencing Costa Rica for the first time and therefore absolutely unforgettable. Take a leisure stroll or an intense hike (it’s your choice, since it’s your tour) with a highly trained, well-educated Costa Rican naturalist guide through our exotic, bio-diverse tropical rain forest which has been preserved for over 40 years. The pace of this adventure is determined by your group’s abilities and interests, and the amount of wildlife you want to stop for and observe (or learn about) – all in their natural and breathtaking habitat. Watch sloths and numerous species of monkeys travel through the tree canopy, hunt for nocturnal silky anteaters and several types of non-poisonous snakes resting in the tropical rain forest, and listen to the songs of the various birds as they glide above your group. Be surprised by how many different kinds of animals as well as flora and fauna you can observe in the span of a 2 ½ hour nature walk or hike. And whenever you are ready, stop and enjoy some local fresh fruits and refreshments as you pause to savor your adventure thus far. If you like, take additional hikes through the trails and enjoy unspoiled, un-crowded, pristine beaches after your guided educational adventure ends. Learn about the history of the Quepoa Indigenous people and Costa Rica’s history in regards to the Manuel Antonio area. Return home with ideas of how to help preserving this priceless ecosystem and national treasure for future generations. Enjoy this unforgettable experience, but leave changed.